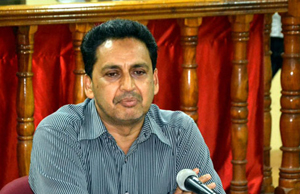 Mangaluru, July 12, 2016: Speaking at a meeting on M-sand here on July 11, Monday, DK DC Adoor B Ibrahim, said that Manufactured sand – known as M-sand – can be an alternative to natural river sand. He said that there was a huge gap between the demand and supply of sand in the state and the government was looking to promote the production of M-sand to meet the supply gaps. The ban on extraction of sand from the rivers during monsoon, construction activities take a serious hit. With the use of M-sand, such activities too can continue, even during the monsoon, explained the deputy commissioner. Manoj Shetty, Trident Infrastructure managing partner, who made a presentation on M-sand, said builders have come across instances of quarry dust being sold as M-sand in the state. “If the M-sand is of substandard quality, then cracks will develop in the building. Substandard M-sand – ie, quarry dust – may go unnoticed even by the construction workers, who have no knowledge of the product,” he said. “M-sand of different grades, from grade 7.5 to 100, is preferred for different types of construction work. Up to 75% of the construction activities in Bengaluru is carried out with the help of M-sand,” he said, adding that ready mix industries use 100% of M-sand for the work. “If the natural sand has salt content in it, then the buildings will develop cracks. M-sand is nothing but segregated quarry dust.” He said that the demand for sand in Bangalore is 16 lakh tonne a month. It was two to three lakh tonne a month 10 years ago. The cost of M-sand per load is Rs 7,500 in Mangaluru. The cost of natural sand in Bengaluru is Rs 2,000 a tonne while M-sand is sold between Rs 900 and Rs 1,500 a tonne, based on the grades. Karnataka State Pollution Control Board Officer Rajashekar Puranik said that the KSPCB licence should be obtained for starting a M-sand unit.